Things looked set to go pear-shaped when Jordan Henderson's penalty was saved, only for Mateus Uribe's spot-kick to rattle the bar and goalkeeper Pickford to deny Carlos Bacca. Sweden now await in a mouth-watering Samara quarter-final on Saturday, which England approach buoyed by a display of character and coolness which belied this group's tender years. But England never do things the easy way. Pickford's incredible one-handed save looked to put Southgate's men through only for Yerry Mina to jump high at a corner to head home three minutes into stoppage time. Barrios, who pushed Sterling to the deck earlier in proceedings, planted a headbutt into Henderson's chest and up to his chin as the players jostled in the wall. 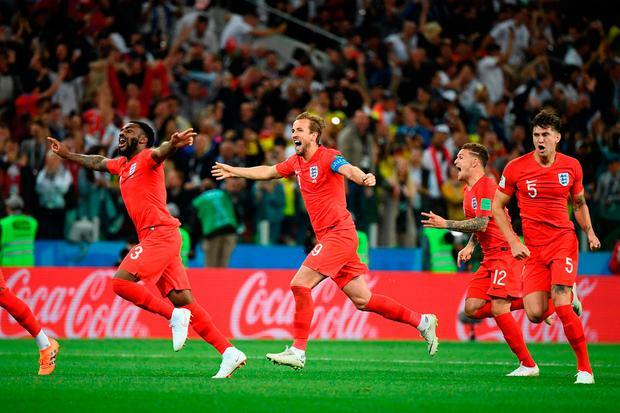 Trippier eventually bent that free-kick wide and Kane drove wide before the break, where Sterling's close attention continued as a Colombian coach barged him. Colombia's players were strangely put out by the decision to pull Carlos Sanchez up for wrestling Kane to the deck, yet Henderson was the only player booked in a lengthy wait that ended with England's captain smashing home. The exasperation was palpable when Juan Cuadrado's miss on the break, just as when Pickford's world-class stoppage-time save denied Uribe's stunning long-range effort. It was a stunning end to normal time that left England ragged and reeling. After struggling through the opening period, Southgate's men ended on top as Jamie Vardy, Danny Rose and Dier had attempts. However, Uribe's attempt hit the crossbar and Kieran Trippier levelled, then Pickford produced a super one-handed save to deny Bacca, before Dier fired home the winner.